Decadent Vegan, Gluten-Free Chocolate Chip Cookies!? Sounds insane I know. But they seriously are crave-able! Adapted from Ovenly's delicious vegan chocolate chip cookies, I used a combination of oat and almond flour to create a soft and chewy texture while the dark brown sugar creates a deep addictive chocolate chip cookie flavor. I don't even miss the gluten! Which is huge because as my son says, I'm a carb-a-viore! I'm always trying to find things that my son can eat without giving in to my battle against sugar and carbs. He can't have too much of each, so moderation is key. But even with moderation (he only eats sweets about once a week), I still can't feel completely guiltless giving him an Oreo. Maybe I'm just trying to protect him, or maybe its just my control issues, but I want to make sure that whatever I give him has the least amount of sugar and carbs possible. And the only way to do that is to make it myself. So here I go! Ovenly in NYC has amazing vegan cookies. I tried one as an after lunch snack and had no idea they were vegan. 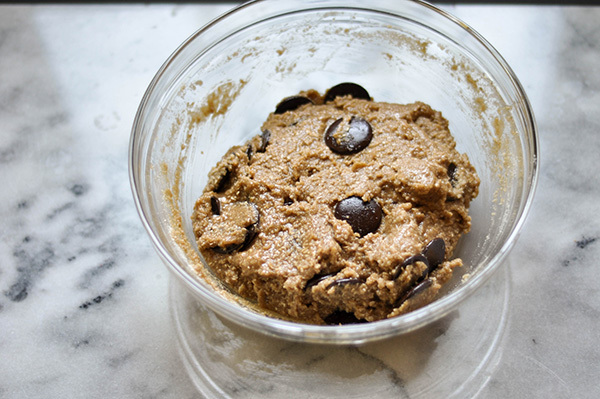 Who knew you could make a great cookie without butter or eggs! But they did it. This cookie only uses oil and has no funky ingredients like xanthan gum, which gives me anxiety just thinking about it. I had a feeling the dough would require some refrigeration time, since oil isn't solid enough to bake as is, but also allows all the flavors to really absorb into the flour. This dough requires 12-24 hours of refrigeration to help solidify the oil and keep the cookies shape in the oven. Though the beauty of this recipe is that since there's no butter to beat, you do it all by hand in one bowl! I cut a 1/4 cup of sugar from the original recipe and used a dark brown sugar instead. I figured it would add more depth of flavor instead of extra sweetness. 1/4 is not a lot to cut, but I figured it was something and I didn't want to jeopardize the cookie texture by cutting too much. I tried to only use oat flour at first, but the dough was just liquid, I needed something more and decided to add almond flour to it. It gave the dough more texture without the carbs! And it worked beautifully. The hardest part was waiting the 12+ hours before I could bake them. So plan accordingly people, because these chewy chocolate chip cookies are well worth the wait! 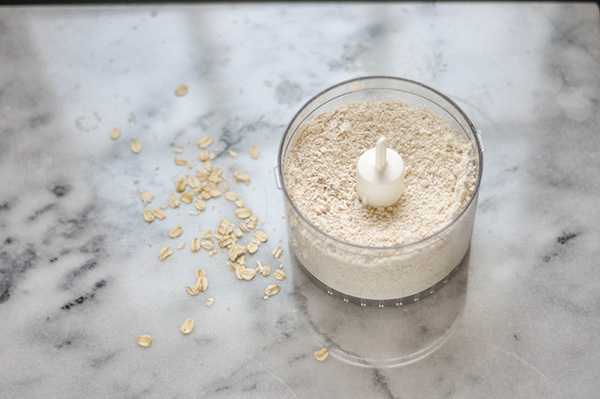 In a large bowl, whisk together oat flour, almond flour, baking powder, baking soda, and salt. Add the chocolate chips to the flour mixture and toss to coat. In another bowl, whisk the sugars briskly with the canola oil and water until smooth and incorporated. Add the flour mixture to the sugar mixture, and then stir until the just combined and there are no dry spots. The dough will be pretty liquid. Cover with plastic wrap. Refrigerate the dough for at least 12 hours and up to 24 hours. Do not skip this step! The dough needs to be thoroughly chilled in order to keep its shape when baked! Preheat the oven to 350° F. Line two rimmed sheet pans with parchment paper. Remove dough from the refrigerator and use an ice cream scoop or a spoon to portion dough into 2-inch mounds. Sprinkle the dough balls with salt and freeze for 10-15 minutes before baking to help keep the cookies shape as they're baking. *These can also be frozen at this point for future chocolate cravings. Just freeze on a sheet tray till solid then place in a freezer bag and then bake straight from frozen when the crazing hits!